For more than ten years, Western public opinion has been led to believe, without any hard evidence, that Iran constitutes a threat to global security. In the context of the U.S.-led “Global War on Terror”, this propaganda has been intensified, with various attempts to link Iran to 9/11, as well as to other terrorist attacks targeting Israelis in various countries and for which “Iran-backed Hezbollah” was held responsible, again without hard evidence. In addition, the idea hammered by the Western mainstream media that Iran is developing nuclear weapons, is also based on assumptions rather than hard facts. In turn, Israel’s nuclear arsenal is never mentioned. The “Iranian threat” played a major role in the 2008 elections: we may recall John McCain’s infamous travesty of a Beach Boys classic “Bomb Bomb Iran”? The 2012 U.S. elections will again set the stage for anti-Iran propaganda with Israel’s threats of a “preemptive attack” on the Islamic Republic. 1. Who at the political level decides on launching this war? Washington or Tel Aviv? 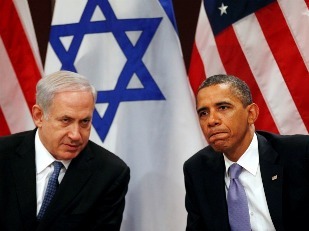 2.Who are the economic powers elites which overshadow the political process in both the US and Israel? Here is a list of selected articles on this hot topic. An attack on Iran before a U.S. election with the goal of dooming the incumbent president?